The concept of a fairy tale is that there's a character facing undue hardship given an out in the form of some magical experience or quest. More often than not, the down on their luck recipient wants to follow through to better their position, but there are times when that's not always the case. 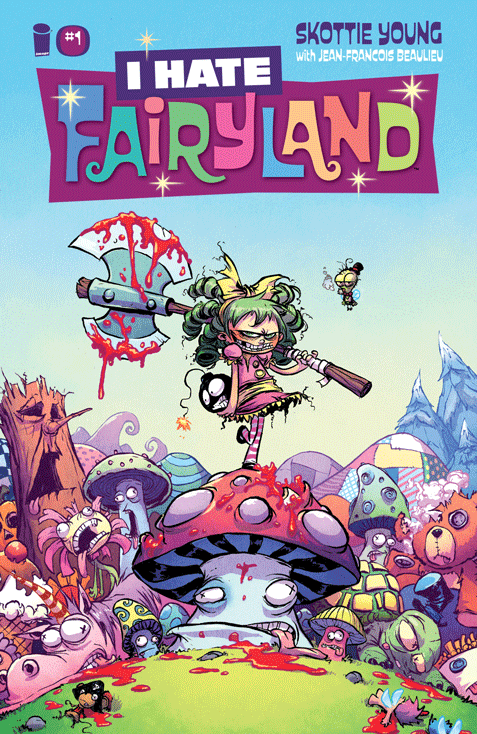 I Hate Fairyland #1 from Image Comics is one such book, where the main character wants nothing to do with the magic of fairy tales. The issue is written and illustrated by Skottie Young, colored by Jean-Francois Beaulieu and lettered by Nate Piekos of BLAMBOT!. In an adventure that ain't for the little kiddies, (unless you have super cool parents, then whatever), you'll meet Gert-a six year old girl who has been stuck in the magical world of Fairyland for thirty years and will hack and slash her way through anything to find her way back home. Join Gert and her giant battle-axe on a delightfully blood soaked journey to see who will survive the girl who hates Fairyland. The premise behind I Hate Fairlyand #1 is actually pretty clever, as it asks what would happen if the main character in a fairy tale didn't want to go to the faraway land. Young writes Gertrude as someone jaded by the entire experience and who's more content to cause havoc as opposed to fall in line. Her interactions with the "wonders" of Fairyland are extremely amusing, as she blasts preconceived notions in the face by literally doing just that. From an actual narrative perspective, Young establishes the stakes pretty clearly, even if getting Gertrude from point A to B is a little disorganized and hurried. The rivalry is clearly being established though and Young's dialogue doesn't pull any punches as far as Gertrude not being shy about expressing her true feelings. Considering the very mature take on the concept of fairy tales, Young's artwork is very much up to the task of rendering such a graphic approach. The bright colors by Beaulieu and general happy-looking residents of Fairy Land work together well to offer the notion that things will work themselves out. A few pages in though and Gertrude is blasting someone with a shotgun, illustrated to fantastic gory effect by Young. The tonal shift in appearance is what Young uses effectively to demonstrate Gertrude's disdain for the otherwise cheerful disposition of a land rife with magic. Young designs each different area of Fairyland as another area of a somewhat delusional theme park, full of interesting characters facing off with a violently angry Gertrude. I Hate Fairyland #1 is a very perverted take on the concept of old fairy tales, where the main character actually wants nothing to do with the fairy tale itself. Gertrude has spent way too long in Fairyland trying to get out and if that's the case, it doesn't really matter how "magical" a place is before that person starts losing it. Young's story is definitely a great twist, but there are some concerns as to where it will go in future issues, seeing as how the first issue has already laid out all the stakes. Young's art is the perfect mix of Muppet Babies and Heavy Metal, blending the two in a way that makes the world seem terrifying to the reader. I Hate Fairyland #1 may seem all-ages, but it's decidedly not, which is a great thing for the story. I Hate Fairyland #1 is in stores now.